It feels little bit unreal when I think of it. Like most of the things over the past year. As it seems I was in Borlänge yesterday. There were no Peace&Love festival. And it wasn´t exactly summer. I didn´ t travel back to the Czech Republic as I used to do. I just got on a train and went home. To Stockholm. But that doesn´t matter, that is not what is it all about. 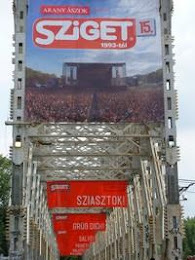 It´s about one concert. One concert in Folkets park, over there where I saw The Vaccines or Carl Norén playing once. Everything seemed to be so small, the whole park, the whole Borlänge. Small and quiet. And there was me. Small and insignificant, unable to change it, we all were. Just powerless against that huge mistake. As always. Cause there were suppouse to play Sugarplum Fairy that day. And they didn´t. Cause there were one moment, one instant when everything was absolutely wrong and I just couldn´t bare it. The whole picture was broken. There were Viktor and Carl Norén singing Sweet Jackie. There were Gustaf and the band Mando Diao. It was in Borlänge on Athena stage. And I knew that this is not the way it should be. I shouldn´t be there. 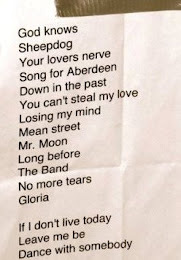 They should´t be singing that song on that stage with Mando Diao. They shouldn´t be there at all. It was surreal and absurd picture saying me that maybe there was no sence in anything after all. That the dreams are fake. It wasn´t sadness, it was all just too unbelievable to me. Like most of the things over the past year. I heard one stupid song when I went to the station the other day. To the train that took me from Borlänge. From that city where it all started for me once. So there was this song. I don´t really know the lyrics but she sung something like: "You´re the reason why I´m here." And she was true. 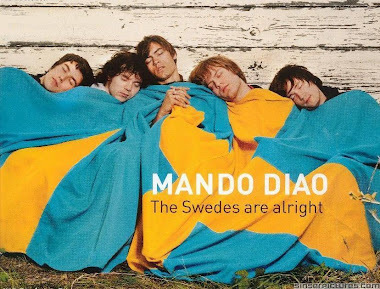 Cause Mando Diao, if I never ever got to know you I woudn´t live in Sweden. I woudn´t got to know the other bands. The other people. The people who now means so much, so much it´s almost hard to breath. I woudn´t have written what i wrote. I woudn´t dream the same dreams. My life would have been completely, absolutely different, on different place, with different story. My whole past. Maybe my whole future. That pain. That sadness would be different. All that happienes. The sense. The point. Me. I would have been diffrent person. And in that moment, while you were playing Sweet Jackie I wasn´t really sure if it is right. But it must be, don´t you think? Cause it must have been the year 2008 or something and I was stading on the bus stop, listening to "You Don´t Understand Me" and there is this line saying: But I will always be the one who holds you in the end... and I thought it was true. Is it?